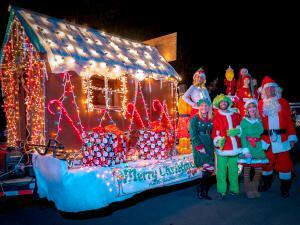 CALISTOGA, CA, UNITED STATES, November 8, 2018 /EINPresswire.com/ -- Bring your loved ones to the winter wonderland of Calistoga on Friday, Nov. 30 through Sunday, Dec. 2 for a fun-filled weekend packed with holiday festivities. The celebration begins Friday, Nov. 30 at 4pm with face painting, ornament making and more fun for the kids at the Calistoga Holiday Village Tree Lighting, presented by the Calistoga Chamber of Commerce and the City of Calistoga. Enjoy house-made gumbo from Evangeline, holiday treats and beverages, and sip on Calistoga wines in the Calistoga Winegrowers’ North Pole Wine Garden. After the tree lighting, follow Santa Claus on his lighted tractor over to the Mount View Hotel for photos.